What is realtime and how can I utilize it? Realtime reporting is a process that allows a court reporter to attach a laptop computer to his or her stenographic machine via cable or wirelessly. As the reporter is reporting the proceedings, the testimony comes up on a laptop screen or multiple screens. 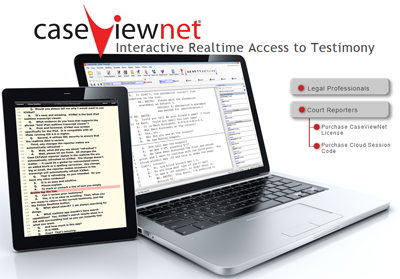 Appalachian Court Reporting provides the laptop for you, which allows you to receive the testimony directly with CaseViewNet, ICVNet, which allows parties to read the text file, make notes, scroll text for review of testimony, preparation of direct examination or cross-examination, and is designed to cover near limitless applications.